Take on seven ziplines and three swinging bridges on a 2.5-hour zipline canopy tour in Charleston. Challenge yourself to try longer and longer ziplines as you follow the course with a guide and small group, then finish the tour on a zipline that stretches 750 feet (229 mt.) through the South Carolina trees. Make your way to the Charleston Zipline home base, a short drive from the historic downtown. Learn the basics of safety and technique: get fitted with a harness and helmet, then try clipping in and self-braking. This is the perfect way to take on an exciting, adventurous challenge in a fully-supervised safe environment, and offers a unique vantage point on the forest near Charleston. Head up into the treetops with your guide, who will assist with the ziplines as you move through the course. 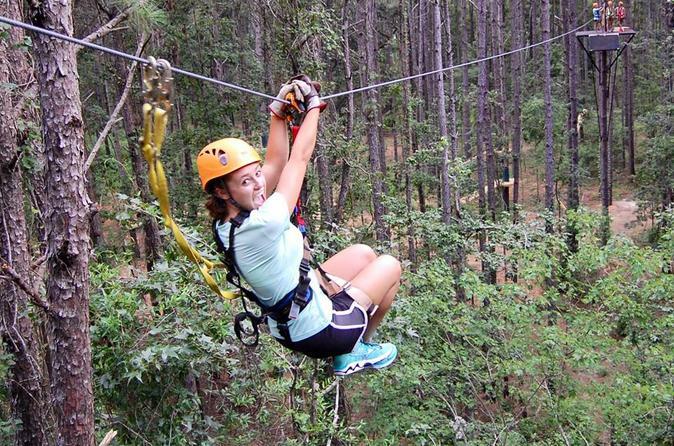 Clip into each zipline using your harness, then launch into the air for a ride between the trees. Hold on tight as you cross wobbly swing bridges, and work your way towards the biggest zipline of all. This zipline adventure is well suited to participants of 10 years or older (children ages 10–13 must be accompanied by an adult), and there is a weight restriction of 70 and 250 pounds (31 to 113 kg. ).